Soon I found myself face to face with the interesting Falling Man petroglyph that I had come to see. This spot of color on the sandstone was found nearby. There were many smaller petroglyph panels to be found as I hiked around the area. This large boulder was the next larger site I came across. As I climbed around the maze some more I found myself on a ledge containing another nice set of petroglyphs. A better look at the right side. While standing on the ledge I noticed there was another large panel of petroglyphs right below my feet. 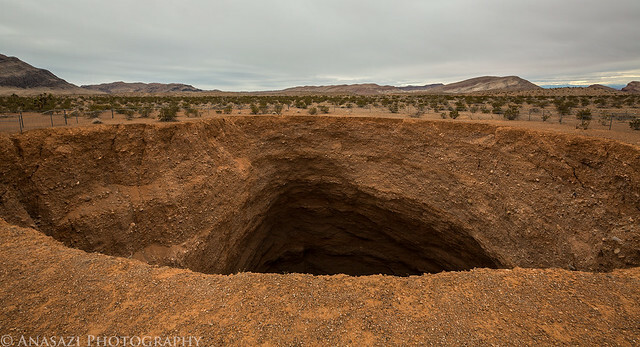 There was no immediate way down to the next level, so I hiked around until I found a way down. When I reached the panel I was treated to another impressive group of petroglyphs. Great colors in the sandstone found in this area. You might also notice that the overcast skies finally started to clear out a little as I explored the area. Petroglyphs and colorful sandstone, a wonderful combination. One of the many small panels found in the area. Hiking back to my Jeep among the Joshua Trees. Before heading back to the interstate, I made one last stop near Whitney Pocket so I could search for some more rock art. The petroglyphs I found here were faded and harder to see, but I liked this panel surrounded by bright green lichen. From Whitney Pocket I drove back north until I reached the interstate. 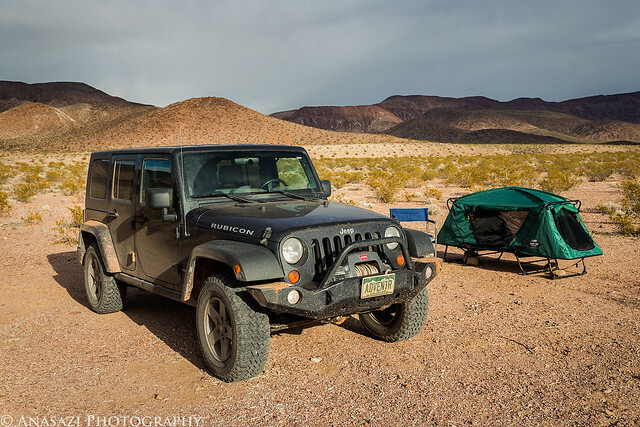 I headed west and grabbed some lunch on the outskirts of Las Vegas before finishing the drive to Death Valley National Park. 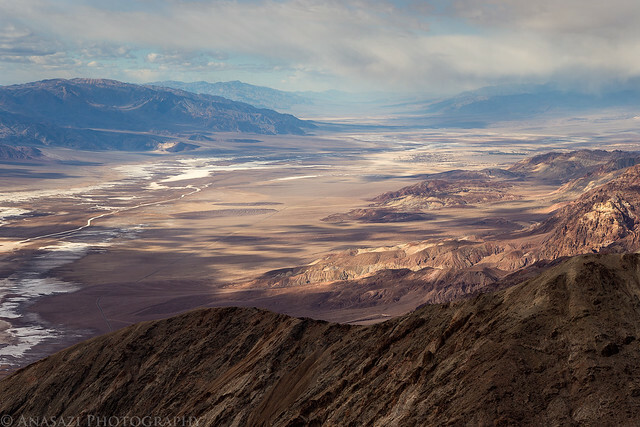 Once in the park I drove up to Dante’s View which overlooks Badwater and a good portion of Death Valley. There were quite a few people at the viewpoint, so I hiked to the top of Dante’s Peak which I had all to myself. 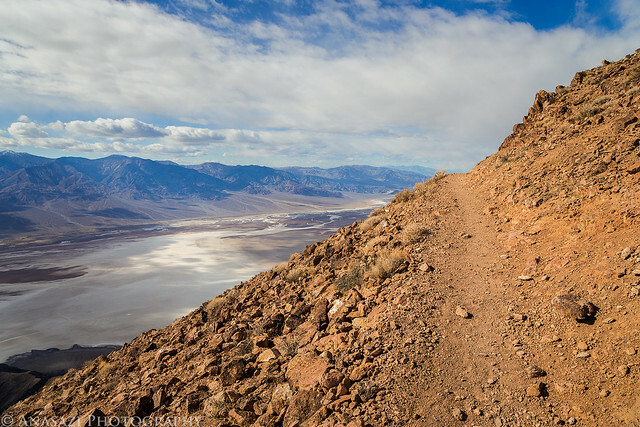 Following the trail to Dante’s Peak over Badwater. 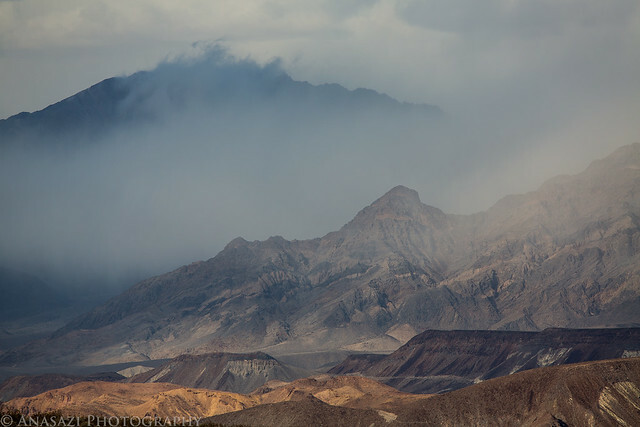 There were some storms and clouds moving over Death Valley adding some drama to the landscape. 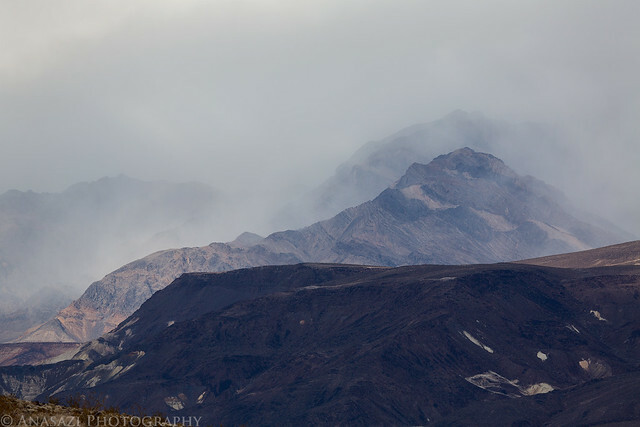 The surrounding mountains play hide and seek in the low clouds. I could sit and watch this dynamic scene all day. After my hike to Dante’s Peak I decided to drive back down and find a campsite in Greenwater Valley before it got dark out. 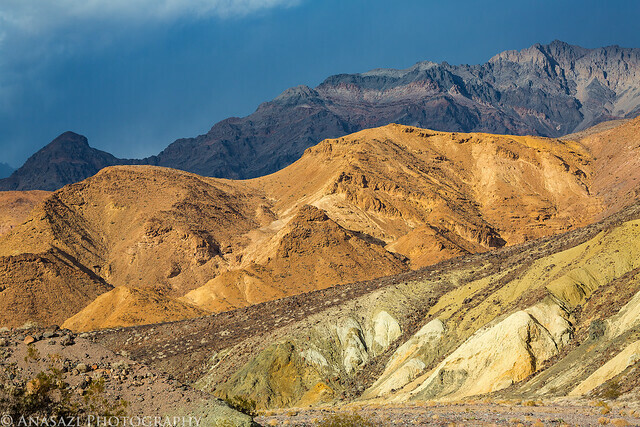 Once my camp was setup I make a quick drive over to Zabriskie Point so I could scout out the location for the following morning’s sunrise. On my way I pulled over when these layers of desert colors caught my attention. 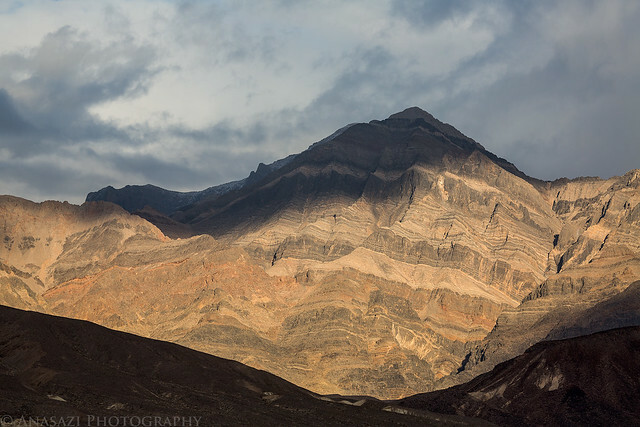 The clouds and storms in the area create a momentary spotlight on this peak. 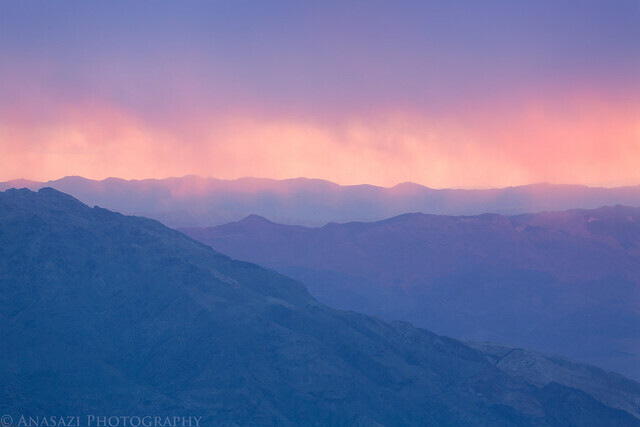 After checking out Zabriskie Point I drove back up to Dante’s View to catch the sunset. 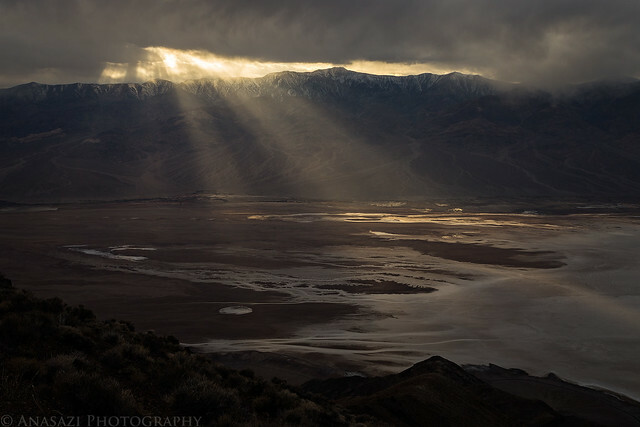 When I arrived at the top there were a lot of clouds blocking the light, but the sun did manage to slip through a small hole to light up small sections of the valley floor. I thought this looked like a cool little cloud. 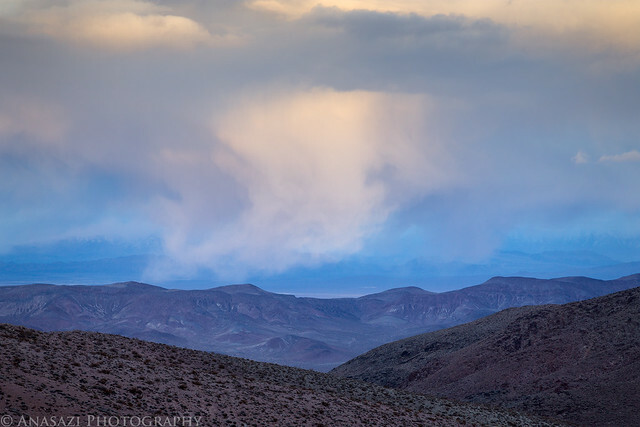 There were too many clouds for a great sunset, but shortly after the sun dipped below the Panamint Range these clouds did get a little color. I stayed at the viewpoint until I was the last one up there (this is usually the case). As I started my drive back down to camp it actually started snowing a little bit, but once I lost a little elevation I managed to get out of the snow. Once I was back in camp I had a little dinner, read for a little while and fell fast asleep so I would be ready for a new day.